Who cares about Darfur these days? The conflict in the western Sudanese region, which galvanized public opinion in the middle of the last decade, is now rarely in the headlines. This is not because the area is calm. Renewed violence has displaced 300,000 of its inhabitants this year alone. The United Nations and African Union still have 19,000 troops and police officers trying to keep the peace there. 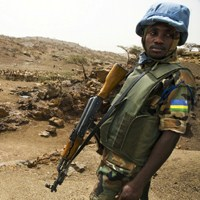 But fresher crises, such as those in Mali and Syria, have long replaced Darfur at the top of the international agenda.